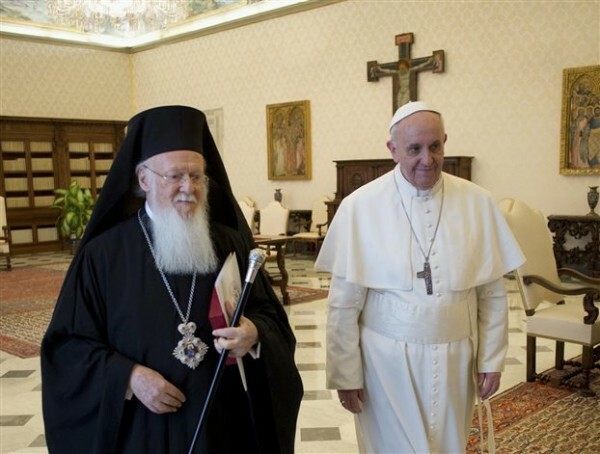 Pope Francis sent a message to Patriarch Bartholomew on the occasion of the Feast of St. Andrew, urging Catholics and the Orthodox to offer a “credible and effective witness” to the Christian values of trust, respect, charity, and reconciliation. According to Vatican Radio, the message was hand delivered to the Orthodox leader in Istanbul by the head of the Pontifical Council for Promoting Christian Unity, Cardinal Kurt Koch, who led a delegation to the Patriarchal Church of St George for the feast of St. Andrew on Monday November 30th. At all levels of Church life, the Pope says, relations between Catholics and the Orthodox must increasingly reflect the logic of love that leaves no room for the spirit of rivalry. Together, he insists, we must offer the world a credible witness to Christ message of reconciliation – especially in light of so much blood which has been shed in recent terrorist attacks. Praising the Patriarch’s “fervent commitment to the critical issue of care for creation” Pope Francis says it is providential that the 50th anniversary of Catholic-Orthodox rapprochement occurs on the eve of the Year of Mercy. Asking all Orthodox faithful to pray that the Jubilee year may bear the spiritual fruits for which we yearn, the Pope concludes by assuring the Patriarch of his prayers for the Pan-Orthodox Synod which is due to take place in 2016.